Ever wanted to take drums out of a track but lacked the track outs? On the other side, have you ever wanted to turn the drums up on a stereo track for hip hop production? Well either way, you’re in luck. Zynaptiq has the solution to your percussive woes with UNMIX::DRUMS. Zynaptiq announced the immediate availability of UNMIX::DRUMS, their new source separation-based plug-in for controlling the level of drums in mixed music. Zynaptiq will be showing UNMIX::DRUMS at their booth 842 at the 139th AES convention, Oct 29th-Nov 1st, 2015, NYC. 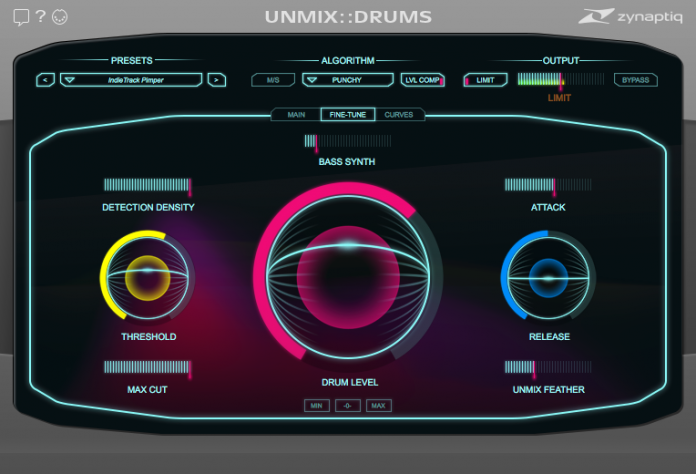 UNMIX::DRUMS is the world’s first audio plug-in that allows attenuating or boosting drums in mixed music, in real-time. Using advanced source signal separation (a.k.a. de-mixing, unmixing, sound extraction, sound isolation) technology under the hood, UNMIX::DRUMS provides frequency dependent drum level control that ranges from up to +18dB of boost to virtually complete removal* – while always sounding great. Whether used on a full mix or on a drum bus, UNMIX::DRUMS can be used to shape and enhance the impact of drums in a unique new way. Sporting an intuitive multi-level GUI, frequency dependent control of key parameters, a sample accurate sub-bass (re)synthesizer, a high-precision analyzer display, M/S operation and an output limiter, UNMIX::DRUMS opens up exciting new options for mastering, music production, sample-based music creation, mash-up artists, remixers and DJs. Intuitive 3-way GUI Design.UNMIX::DRUMS supports all common sampling rates from 44.1kHz to 192kHz, mono and stereo, as AAX native, AU, RTAS and VST, on Mac & Windows. Zynaptiq GmbH, based in Hannover, Germany, creates audio software based on pattern recognition, source separation, perceptual modelling and other advanced technologies.